Now immediately, I want to say, I am not a nutritionist, and I am speaking solely from my own experience having finally, nearly two years ago, lost those last 10 pounds after trying for ten years to get them to simply go away. Last year I shared in depth ideas on how to get and stay in shape (click here to read), so today I’d like to simply share ways that have worked for me to take off and keep off those last few pounds. There is an inner confidence that fills you from within when you feel and know your body is healthy and at its optimal performance. You wear your clothes with more confidence, you hold your head a bit higher and you begin to enjoy being in your own skin, celebrating others for their beauty instead of being envious because of them you are content with who you are. 1. Drastically reduce or eliminate processed foods. When I reviewed Nell Stephenson’s book Paleoista, I was introduced to a handful of ideas that I began to incorporate my life. No, I am not a full-fledged paleoista. After all, I am a Francophile and proud of it, and that includes the cuisine as well – cheese, bread, and chocolates – but I came to realize that so much of what she shared made since. Why would I want to fill my body with ingredients that aren’t really food? Why would I want to abuse my body that way? So I’ve tried to consciously and significantly limit the processed food that I eat – no pizza, less milk, nothing out of a box, reduced pasta meals, no cookies, etc. I certainly feel less bloated and more satiated because what I do choose to eat is more balanced and satisfying. 2. Reduce your sugar intake. Refined sugars found in many of our desserts, condiments, sauces, and morning treats just to name a few, are items that by reducing can surprisingly cut your craving for sugar throughout the day. I was amazed how when I chose not eat cookies anymore, that I actually didn’t crave them after a certain amount of time. Natural sugars from fruit – go for it, but again, it comes back to my first point – reduce the processed foods. 3. Ditch the soda/pop. I’ve never been one to enjoy pop. I’m not a saint by any means, but to me I was always conscious of my calories and saw liquids as a waste of calories that I could have enjoyed far more in a wonderful meal. So my drink of choice is water or tea. There is something very refreshing about a cool glass of ice water with a hint of lemon that quenches my thirst every single time. Not only is it healthier, but it’s easier on my wallet. 4. Keep your exercise regimen simple. As I mentioned in my post last year, I used to workout like a fiend as I was a step aerobics instructor during college sometimes teaching three classes a day. What I discovered is that while I need to do something aerobic everything single day, I don’t need to beat my body to a pulp to achieve the results I want. There may be times when you want to train for a marathon or triathlon, so you change your training, but otherwise, simply stick to a regular routine (for me I prefer walking briskly) and do it every single day. Eventually you will see positive results. 5. Allow yourself to feel hungry. I have read my fair share of fitness and diet books, and many of them state that we should eat every three hours. While this may work for some people, what I’ve discovered is that if I never let my body feel hungry (not starving), I am never certain what it really needs. If you truly are in tune with your body, you will know what it needs – protein, vegetables, water to feel hydrated. But to understand your body you must pay attention and you must not continually be shoving food down your throat simply out of habit or because it’s in front of you. 6. Include protein and fiber. A quick way to satiate your hunger that often gets forgotten because we are being bombarded by sugary concoctions is the amazing powers of protein and fiber. While it does take time for our bodies to register when we are full (approximately 20 minutes), after eating some protein – chicken, fish, etc or having some fiber – for me it’s oatmeal (porridge) in the morning, you’ll stay full longer than if you just popped a Starbucks coffee cake in your tummy with a side of a tall latte. 7. Keep portion sizes in check. 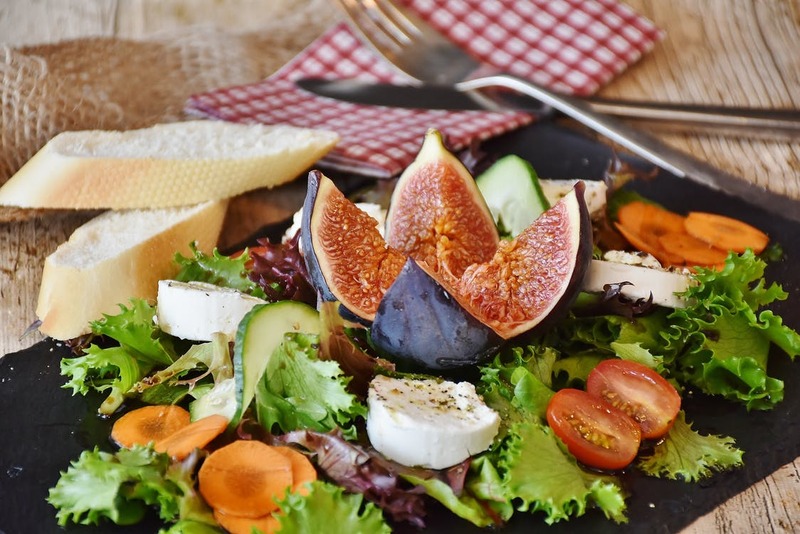 Whether you choose to use smaller plates or simply place less food on your plate, allow yourself to get used to smaller portions, but make the portions you are eating delicious and filling, so you are less likely to notice the reduced amount. 8. A wonderful night’s sleep. The power of a good night’s sleep is quite profound. Not only does it help us feel more energized, but also when we sleep a full 7-8 hours our body isn’t begging for food to keep going if we are pushing it beyond what it can do. 9. Lift weights. You certainly don’t have to do anything drastic, but choose to incorporate a strength program into your weekly routine (1-3 times a week) that targets your arms, legs, abs and anything else of interest. You can easily do this type of routine at home with a few dumbbells from your second-hand store and a yoga mat, and it doesn’t need to take longer than 10-15 minutes. 11. Walk more, drive less. Walking is one of the easiest exercises to incorporate into our daily lives no matter where we live and no matter what climate we live in. Either incorporate it into your daily routine or hop on a treadmill. 12. Be consistent. Once you have incorporated these habits into your daily life, the changes you seek won’t happen overnight, but they will happen with consistency. Find pleasure in these routines and somehow make them your own. In doing this, you are certainly more apt to continue to do them regularly. 13. Always keep in mind moderation. The only thing I have cut out of my diet are cookies (and that’s only because I can’t say no to just one). Other than that, I eat real food – whatever I want, but I try to enjoy the bites I have and really savor well-took meals. Whenever I have indulged with a particular food too much, I am not as fond of it or don’t enjoy it as much the second time around, partially because it feels comfortable (physically) to eat too much, and no one wants to feel that way after a meal. 14. Be kind and forgiving to yourself. Sticking to anything 100% of the time isn’t going to be possible, but what makes these work for me is that if I do slip up, I don’t beat myself up. Instead, I get back on track immediately and move forward. After all, we’re human. We’re going to make mistakes, but the longer we stick to habits that we gradually see working, the more apt we are to be less tempted to stray. 15. Create a life you love. Continually strive to create a life that involves your passion, routines that invigorate you and people who uplift you. When you create a life that you love, you will choose to eat food to fuel you, not to comfort you, and then . . . then, you will have become the master of food and not the other way around. Make no mistake. I am not stick-thin. In fact, I remember shopping in Paris this summer in Eric Bompard being helped by one of the saleswomen and noticing that her hips were quite narrow compared to mine, but you know what? For the first time, I was happy in my body. I knew I was at a weight that I am happy with and love, so I could appreciate her unique beauty and not be envious. It was an amazing feeling! I know these tips sound far too simple, and I trust me I know that every body is different, but once we establish the idea of respecting our bodies and not reaching for food to make us happy, we will find a happier way of living because we will feel better in our skin and discover we are beginning to live up to our true potential. I want to loose my last 5! I did loose 5 over the course of the last year. And I was not dieting, I simply changed certain eating habits like replacing bread for breakfast with oatmeal and fruits..
Shannon, I don’t know if it is the change in seasons or something else, but the past few weeks I have been eager to change my pace – related to everything. I have been reading some paleo type books, getting a better understanding of how food affects me. I can honestly say that as much as I miss my morning bowl of oats, I no longer feel tired after my breakfast smoothie. I am also trying to change up my workout routines, opting for more barre type workouts as opposed to heavy weights. I want to clean my closet out, for good, get rid of anything that really doesn’t make me feel my best – regardless of what I paid for it or how many times I did (or did not) wear it. And last night I picked up French Women for all Seasons and began reading it. Alas, I cannot wait to read your blog each morning, as it seems every post you write hits home with me. Great tips. I’ve lived this way for the past 10 years, with a few detours on holidays, and my weight has stayed within 5 pounds of my ideal weight. Moderation is a very good thing. Wonderful points. Thank you for sharing. Timely post for me! I’m back from vacation and probably heavier than I’ve ever been. Ironically, that means I’m only about 8-10 pounds heavier than I want to be, but past experience has shown me I tend to linger at “just a bit more” than I would like. It’s definitely time for me to re-read French Women Don’t Get Fat. Great post with valuable points! Im a mother of four and have managed to keep my prepregnancy weight by doing these same things. I have my moments for sure but can really tell a big difference when Im eating cleaner! I always appreciate your thoughtful, insightful posts Shannon. These tips are practical and definitely work, if we work them. I agree with allowing ourselves to get slightly hungry, rather than snacking all the time. I think it’s nice to give our digestive systems a break between meals. So glad to hear you loved Paris and London. I’ve been to Paris several times and will be spending the holidays on a trip to London and Paris with my family (ages 14-82) this year. Great points. I was just thinking of doing a post about my favorite “diet” books and those were the 3. How funny! I’ve recommended Bethenny’s book to quite a few friends. I love her point about economies of scale when it comes to eating and stopping after the bites become less and less satisfying. I re-read french women don’t get fat every so often. It’s great to have such good reminders. Thanks! This is a fantastic reminder. My husband and I are on a “Daniel Cleanse” (which is basically just vegan plus no sugar) for a month, just to recalibrate before the holidays. Just before, I had recently reread French Women Don’t Get Fat as well, and I was reminded of so many of these just simple principles. And I loved what you said as well about it’s ok to be a little hungry. When I stopped to think about it, we’ve heard all our lives, don’t get hungry. But it’s ok to be a little hungry. My American brain has decided I can never be anything but full, but it makes food taste amazing! Goodbye those last 5 pounds! I always so enjoy your posts! Thank you so much for consistently creating such quality content. While I enjoyed reading your post, I find that the term “processed foods” can be misleading. Processing food is not inherently bad, actually cooking is a way of processing. Oatmeal certainly counts as processed food, since it is usually heated, steamed and rolled or cut before sold. What we need to look out for is additives like sugar and salt, refined foods like white flour, and processed meat in the form of sausages, bacon et cetera, since these seem to be cancerogenous. This may not seem like a big issue, but warning against processed foods in general can be misleading and cause people to avoid perfectly healthy food. Linda, You are absolutely right regarding the technical definition of processed. I should have been more clear. By processed, I meant anything that comes in a box with additives or anything not grown from the earth. If it can sit on a shelf for an extensive period of time, it probably isn’t something we want to eat. Thank you for your comment.